Who purchases wholesale printed books? 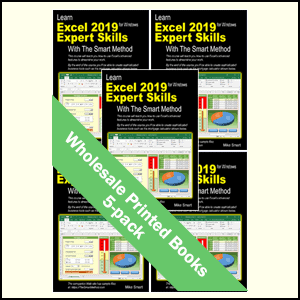 Anybody can purchase wholesale books but typical wholesale customers include schools, colleges, universities, government agencies, employment agencies and freelance Excel instructors. Books cannot be returned once purchased. Orders cannot be cancelled after the books have been dispatched to you. Books are always delivered free of charge to USA (including Alaska, Hawaii, Puerto Rico, Military Bases and Protectorates), Canada, UK, Europe, Australia and New Zealand addresses. Books are usually delivered free of charge to all other countries but in some remote locations we may have to quote and agree a delivery charge. Orders will normally be received within six to twelve working days but this cannot be absolutely guaranteed. 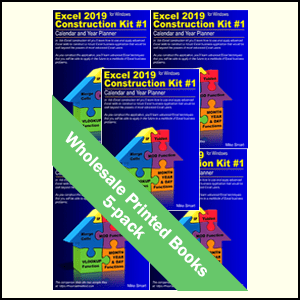 Wholesale books are only sold in boxes of five books (which must all be the same title). 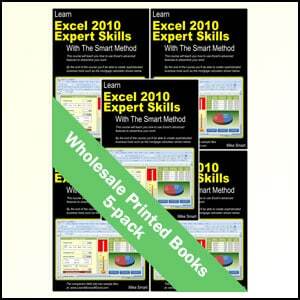 If you need less books there are direct links to Amazon here. Please read our full wholesale terms and conditions before ordering. 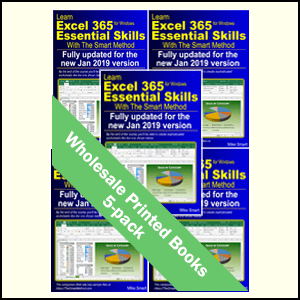 Excel 365 for Windows (First Edition: updated for the January 2019 Semi-Annual version 1808). (Price is for a box of FIVE printed books). 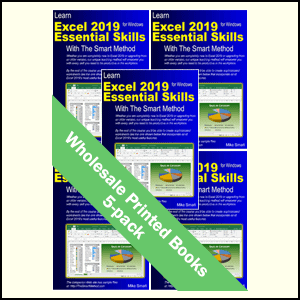 Excel 2019 for Windows. (Price is for a box of FIVE printed books). 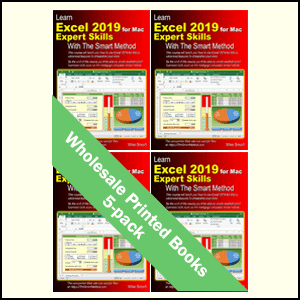 Excel 2019 for Apple Mac (Price is for a box of FIVE printed books). 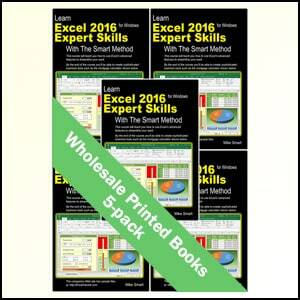 Excel 2016 for Windows. 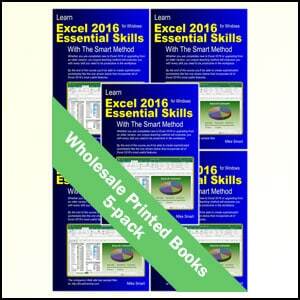 (Price is for a box of FIVE printed books). 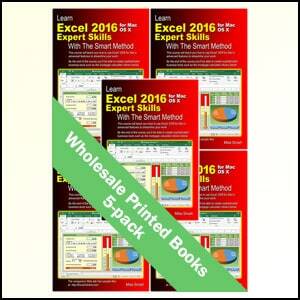 Excel 2016 for Apple Mac wholesale printed books (Price is for a box of FIVE printed books). Excel 2007, 2010 and 2013 wholesale printed books (Price is for a box of FIVE printed books). Excel 2016 Basic Skills for Windows Printed Books. (Price is for a box of FIVE printed books). $3.95 is our genuine cost price of printing and delivery. This 120-page A4 printed book is designed to teach introductory (Basic Skills) Excel classes. The printed books are perfect-bound (glossy color cover with black and white inner). The course takes about five-hours for a self-learner to complete and can be taught (in a small group of up to 6 students hands-on) in as little as half this time. You can also download this book as a free printable e-book. 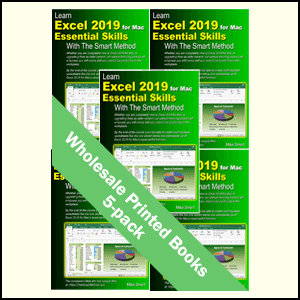 You can also print the book yourself but will find it more cost-effective (and less time-consuming) to purchase books directly from us if you need a quantity of printed books to teach a class. Details of how to print the book yourself can be found here. 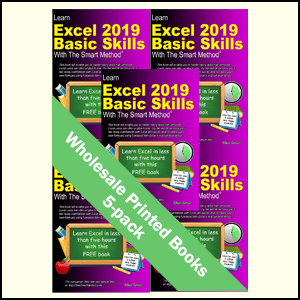 We also publish free Basic Skills e-books (but not printed books) for Excel 2007, Excel 2010, Excel 2013, Excel 2016 for Apple Mac and Excel 2019 for Apple Mac If you need printed copies of these books you’ll need to print them yourself (or have a copy shop print and bind them using the free e-book PDF file). It is a condition of sale that you may not make any charge of any sort for the printed books that you buy. 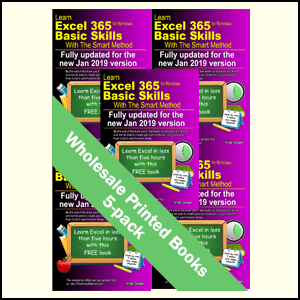 It is permissible, however, to give free copies of the book to students who attend a free (or paid for) class or course.